The fascinating history of present day Baby Point also reaches back into the French period of exploration. 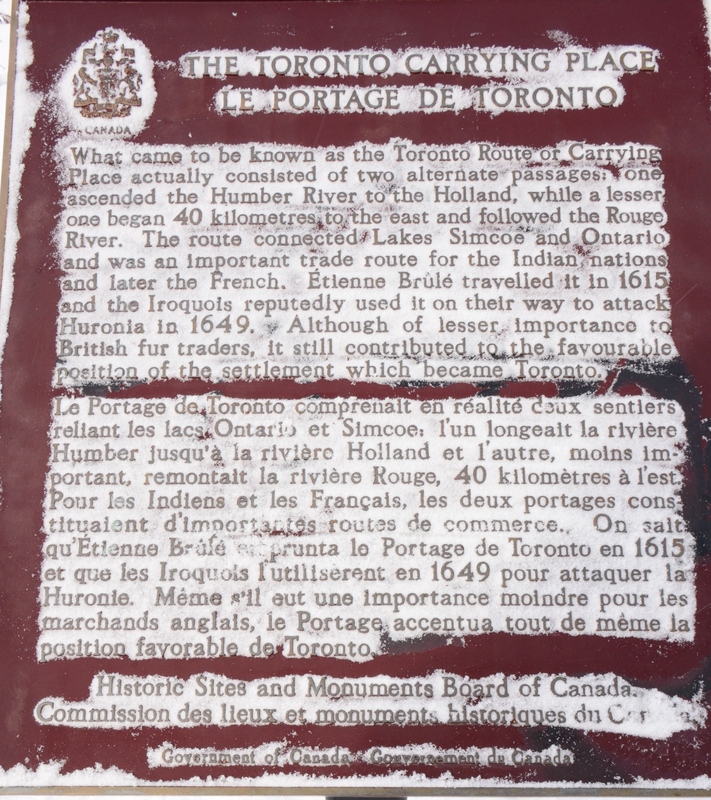 In September 1615, explorer Étienne Brùlé, travelling with a group of Huron/Wendat allies, followed the Carrying Place Trail/Pathway south from Lake Simcoe to Lake Ontario (then Lake Toronto), making Brùlé likely the first white man to reach Lake Ontario. Étienne Brùlé Park, running along the Humber River from the Old Mill to Dundas Street, commemorates his memory and this portion of the Pathway, as do several neighbourhood commemorative plaques. These can be found on Humbercrest Boulevard below Baby Point Road in the parkette and at the entrance to Étienne Brùlé Park.Réne-Robert Cavalier, Sieur de La LaSalle, having walked the Carrying Place Trail/Pathway in his travels, arrived at Teiaiagon in 1678, bartering with the Senecas at Baby Point. Similarly, Joliet also camped on the Point in 1669 on the way north. Father Hennepin of the Recollet Mission also wrote an account of a visit to the Teiaiagon site in December 1678, en route to Niagara. The Douville brothers started trading at the Humber River mouth in 1716. Under the orders of Governor Denonville, Douville built the fort known as Le Magasin Royale in 1720 at Baby Point. The probable location of the fort was where today’s tennis courts and Baby Point Clubhouse stand. In exchange for fur pelts, Douville’s list of traded goods includes buttons, shirts, ribbons, combs, knives, looking glasses, axes, flour, lard, salt, pepper, prunes, raisins, olive oil, tobacco, vermillion, powder and shot. It is thought that the fort fell into decline by 1730 because of aggressive trade competition from the British (to the south) and from the coureurs-de-bois, who cut off the French trade from the north-west by going directly to the First Nations villages to trade with them. The Carrying Place Trail/Pathway was a long portage along the eastern shore of the Humber River.The route terminated when reaching navigable water at some unknown spot on the Holland River near Holland Marsh. It was a route to Lake Simcoe and the fur-rich lands to the north and west. This route was used not only by First Nations, but also by the famous coureur-de-bois. It was integral to the trade for beaver pelts in Canada, feeding the seemingly insatiable European market for fur.